The yew tree, taxus baccata, is a very common tree found all over the British Isles, especially in church graveyards. The yew is one of the oldest living trees in Europe. It was often thought these trees were indestructible, however, they have been known to suffer from root rot. The yew tree will be found in almost all churchyards in England, and will often be planted as hedges. 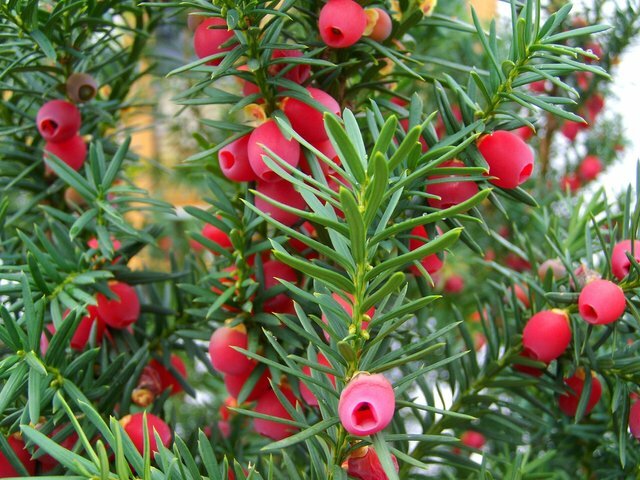 The yew tree is a highly poisonous tree and should not be eaten. The only exception to this is its small red fruits which can be found from summer to late autumn. In each berry is one large seed. It should be noted that the seeds are highly poisonous and only 3 of these seeds is said to be enough to kill a horse. The yew berries have a unique, watery and gelatinous texture and a surprisingly sweet taste. Despite growing on the most poisonous tree in Britain, the yew berries are popular with foragers as a sweet snack during a walk. Many people, understandably, avoid this berry because of the potentially fatal consequences if the seeds are consumed. There is, however, a reliable method of removing the pips without danger of poisoning oneself. Simply pick the berries off the tree and squeeze them gently until the seed pops out. Once the seed is removed it is safe to consume. Personally, I have tried the yew berry and thought that it was ok. I didn't find it extraordiniary so it is not really a berry I eat very often on the trail. Aside from an edibility standpoint, the yew has had some other uses in the past. The abundance of the tree and the wood's flexibility made it the perfect wood to use for longbows. The wood is extremely durable and strong which made it perfect for the intense scenes of battles. Also, this plant has some interesting medicinal uses. 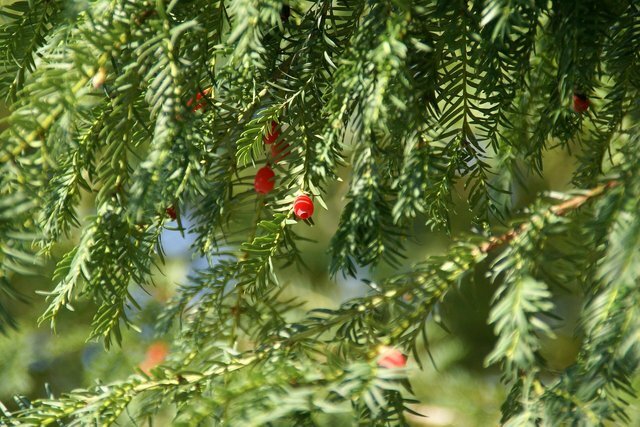 The taxine alkaloids (the highly poisonous chemicals which make the yew tree a deadly poisonous tree) found in the pines are extracted and used in modern medicine for anti-cancer drugs.